The term Hypercar was coined by the Rocky Mountain Institute to refer to ultra-modern, extremely-efficient cars which offer outstandingly clean, safe and economical high performance. Specifically RMI believes hypercars can "achieve 3 to 5-fold improvement in fuel economy, equal or better performance, safety, amenity and affordability, compared to today's vehicles." What are some characteristics of hypercars? Hypercars have very efficient propulsion, weight-efficient construction, and outstanding aerodynamics. While any one of these characteristics alone can create good performance, when all three are combined the resulting hypercars can exceed typical Autobahn speeds, offer good handling, and achieve astounding fuel economy. While there are no hypercars currently in production, many features of hypercars have been incorporated into advanced technology prototypes, show cars, hybrid and electric vehicles. For example the General Motors EV1 (pictured above), Precept and Opel Eco Speedster feature outstanding aerodynamics with drag coefficients vastly lower than current production cars. For example, the coefficient of drag of these cars respectively is 0.19, 0.16 and 0.20. In comparison, the best production cars today have a coefficient of drag at around 0.30 or about 50% to 100% worse. Drag decreases speed and efficiency, and it wastes both fuel and energy. Once designed in, low drag saves energy and fuel and increases efficiency with no recurring or additional costs. Light, strong, rigid and safe chassis are features of the GM Ultralite technology demonstrator, the Aluminum chassis of the production Lotus Elise (pictured above) and the Elise-based Opel Eco Speedster show car. The Eco Speedster also uses an very efficient turbocharged, direct-injected diesel engine to achieve 94 miles per gallon fuel efficiency together with a 155 mile per hour top speed. The Eco Speedster is perhaps the closest anyone has come to creating a hypercar which is fully produceable today at a retail price near $30,000. If Aptera goes into production it will arguably be a hypercar. It's a composite three wheeler with low drag and low mass. Claimed energy usage is about 60 Watt-hours per kilometer or about 97 Watt-hours per mile, which works out to about 380 MPG on electricity. Energy usage on gasoline is much higher due to the inefficiencies of internal combustion engines at about 130 MPG or about 282 Watt-hours per mile. Initial version is electric with a gasoline hybrid to follow. It has a claimed drag coefficient of 0.11, which is outstanding. Unveiled at the 2003 Tokyo Motor Show, Honda's IMAS features an aluminum frame, carbon fiber bodywork and power by Honda's hybrid gasoline/electric IMA drive system. Claimed weight is 700 kg or 1540 pounds with a drag coefficient of 0.20 and 40km/l or 94 MPG fuel efficiency. If Honda would produce a car like IMAS, it would offer near-hypercar performance. Concept Carz coverage of IMAS includes many photos. Other running prototypes at least partially addressing the hypercar idea include the 2001 Daihatsu UFE and 2002 Volkswagen L1 which attain high fuel economy, light weight and good performance. The L1's name derives from the fact that it consumes 1 liter per 100 kilometers which is 239 miles per gallon, while the UFE gets 130 miles per gallon on a standard Japanese mileage test. Daihatsu showed a second generation UFE-2 at the 2003 Tokyo Motor Show. It features a claimed drag coefficient of 0.19 and fuel efficiency of 60 km per liter or 143 miles per gallon. The 2005 UFE-III is a 440 kg gasoline-electric hybrid with claimed 72 km/l and 0.168 Cd. That's 970 pounds and 169 MPG. Volkswagen's 2009 version of the L1 uses 1.38 liters of diesel fuel to go 100 km, so it's not actually a 1 liter car, but it's good to see continued development, even if it's less efficient than the 2002 version. Other specs include 381 kg (840 lbs) weight, 0.8 liter two-cylinder TDI engine, 10 kw (13 horsepower) electric motor for hybrid operation, DSG gearbox. Volkswagen's 2011 XL1 is a continued development, this time with staggered side-by-side seating in a Carbon fiber monocoque with a claimed drag coefficient of 0.186. About the same length and width as a Polo, mass is about 795 kg or about 1750 pounds. XL1 is a plug-in hybrid with a 0.8 liter, 35 kW (48 horsepower) two-cylinder TDI turbodiesel and a 20 kW (27 horsepower) electric motor with 5 kWh Lithium Ion battery pack, coupled to a 7 speed DSG (dual clutch) gearbox. Electric range is about 35 km (22 miles). MPG is about 261 on the EU NEDC driving cycle. The claimed fuel consumption of 0.9 liters per 100 km is complicated by the addition of electric energy which motivates some of the distance travelled. CO2 emissions is quoted at 24 g/km, with the contribution of electric energy unclear. Popular Mechanics and other sites have more information about XL1. VW claims it will produce the XL1, but Aluminum or steel would be much less epensive than Carbon fiber, even with the advanced Resin Transfer Moulding process which VW developed. VW says the new transfer molding process reduces cost by about 50%, but the Carbon fiber vehicle is still 20 times more expensive than Aluminum. Production cars like the Honda Civic Hybrid, Toyota Prius, and Honda Insight offer hybrid drivetrains that use both gasoline engines and electric motors to significantly increase efficiency, especially during stop-and-go city driving. Like battery-powered, pure-electric cars, these hybrids also make use of regenerative braking, which recovers some of the vast energy normally wasted as heat during braking. Regenerative braking works by using a hybrid car's electric motor as a generator to charge the batteries while slowing the car during braking. That stored energy is then used later to accelerate the car. None of these hybrids can be charged from the electric grid. Their only energy source is gasoline. None of the 2003 Honda or Toyota hybrids could be considered hypercars, though the out-of-production Insight comes closest with 50 to 70 miles per gallon possible. The Civic Hybrid is perhaps the best integrated of the current hybrids, and the Toyota Prius the most successful with more than 150,000 of the initial version sold throughout the world from 1997 through 2003. Toyota's second-generation 2004 Prius is an improvement over the first model, and has moved from hand assembly to one of Toyota's highly-automated production lines. Along with this move comes reported profitability. Other forms of regenerative braking that have been demonstrated or are being researched include hydraulic storage of recovered braking energy, and compressed air. The latter is perhaps the most interesting since an automobile engine is fundamentally an air compressor. During braking the engine pumps air into a tank. Accelerating from a stop or at low speeds, the compressed air is released back into the engine to turn it, thus moving the car without any fuel being used. When more acceleration is needed or the compressed air runs out, the engine returns to normal, fueled operation. A wide variety of measurements and terms are used to describe road vehicle efficiency. "Fuel economy", "fuel consumption" all purport to measure how efficiently a vehicle uses energy under some standardized conditions. In the U.S. and U.K., the typical measurement is miles per gallon. (However U.K. uses the larger Imperial Gallon at 4.54 liters, while a U.S. Gallon is 3.78 liters.) On the European continent liters per hundred kilometers is common. A different measurement of Watt-hours per mile or kilometer is commonly used for electric vehicles including fuel cell electric vehicles. However Watt-hours per distance is also well-suited to describing the energy efficiency of internal combustion vehicles, and it allows meaningful comparisons across vehicles with different types of propulsion and energy sources. In the calculations below a U.S. gallon of gasoline is standardized to contain 36,650 Watt-hours of energy, and there are 3.78 liters per gallon. (So there are nearly 10 kWh per liter of gasoline.) Internal combustion engines typically waste about 80% of the energy in their fuel as useless heat. Other measures include kWh/100km (kilowatt hours per 100 kilometers), kJ/km (kilojoules per kilometer), MJ/km (megajoules per kilometer), km/liter (kilometers per liter of gasoline equivalent). Another is km/MJ (kilometers per megajoule). Since one joule is one Watt-second, one kilowatt-hour is 3.6 megajoules. Given that joules are the official SI unit of energy, joules per distance e.g. kilojoules per kilometer may be scientifically preferrable to Watt-hours per distance, however consumers are probably most accustomed to buying electric energy from their electric utility in kilowatt-hours. Another issue is that U.S. miles are shorter than U.K. miles, so figures using miles may not be easily comparable. Kilometers are unambiguous. Most prototype fuel cell electric vehicles use more than 1000 Watt-hours per mile. Production battery electric vehicles use about 200 to 300 Watt-hours per mile. A stock, gasoline, 2005 Chevrolet Equinox SUV uses 1500 Watt-hours per mile at 24 MPG. A depletion-mode, plug-in hybrid version of the Equinox uses 330 Watt-hours per mile. A Prius at 46 MPG uses about 800 Watt-hours per mile. Cal Car's Plug-In Prius uses about 260 Watt-hours per (electric mode) mile or 141 MPG. The Tesla Roadster pure electric sports car uses about 217 Watt-hours per mile (169 MPG). The Toyota RAV4 EV pure electric SUV uses about 300 Watt-hours per mile (120 MPG). C. Michael Lewis' 2008 Electrathon racer used about 1000 Watts to cover about 53 miles in one hour. That's about 19 Watt-hours per mile (1,940 MPG). PAC-CAR II did the equivalent of 5,385 km/l of gasoline or 12,665 MPG or 5385 km (3346 miles) from 9,696 Watt-hours, which works out to about 2.9 Watt-hours per mile. It weighed about 30 kg fully-fueled, without driver. Drag coefficient of the actual car measured in a wind tunnel was 0.075. Other cars in the Shell Eco-Marathon routinely (though requiring great technical effort) achieve 2000-4000 MPG or 20 to 10 Watt-hours per mile. Riversimple Rasa is a very light (580 kg), two-seat, Hydrogen fuel cell vehicle with hub motors and capacitors. Its 8.5 kW fuel cell stack charges the capacitor bank for acceleration and also powers the motors. Claimed range is 300 miles on 1.5 kilograms of hydrogen. At 142 Megajoules per kg of Hydrogen at 700 bar, 1.5 kg is 214 Megajoules, which is about 59 kWh, and 300 miles means 197 Watt-hours per mile, about the same as much heavier EV1. While this is an impressive feat, it again shows how energy inefficient Hydrogen is. It's moving less than half the mass per energy of an EV1 battery electric vehicle. By that measure, it's half as efficient as an EV. One problem with the numbers above is that while they measure vehicle efficiency, they don't measure the efficiency of the energy source. Electric generation is about 50% efficient from the most modern turbines. Electric energy delivered to your home or office is about 40% efficient. Oil and gasoline production, transportation, etc., require large amounts of energy in order to get the finished product to the gas station. (Note that this ignores the environmental costs of fossil fuels.) Hydrogen for fuel cells is commonly made from the steam reformation of natural gas, which extracts Carbon from fossil fuels. Producing Hydrogen from the electrolysis of water typically uses twice as much energy as the resulting fuel itself contains. Fuel cell vehicles are also relatively inefficient. Battery electric vehicles use electric energy in a more direct and efficient way. When "well-to-wheels" efficiency is measured to capture the complete energy impact, battery electric vehicles are the most efficient and result in the least greenhouse gasses, even when charged from coal-fired power plants. When charged from modern natural gas power plants the results are better. Electricity can be made even cleaner from wind, solar, etc. Yes, hypercars use some of the same technology found on modern race cars to create safety cells that make difficult crashes survivable. GM's Ultralite met all corporate and government crash standards thanks to advanced carbon fiber composite sandwich construction also found in high-performance aircraft. Hypercars can use some of the same technology that helps race car drivers survive crashes such as the use of carbon fiber, Kevlar, Aluminum honeycomb, and other advanced materials and design techniques. How is a hypercar different from a supercar? Supercars rely on older technology and ideas such as large engines to produce high performance at the expense of comfort, convenience, efficiency, weight and cost. In contrast, hypercars offer high performance with far greater efficiency through the use of advanced materials, superior aerodynamics, and technologies such as regenerative braking, electric power and hybrid drivetrains. Hypercar, Inc. is commercializing hypercar technology like that found in GM's Ultralite. Rocky Mountain Institute sponsors research about radically efficient hypercars and other issues at the intersection of environment and high-technology. If Aptera goes into production it will arguably be a hypercar. It's a composite three wheeler from Southern California with low drag and low mass. The pre-production models are larger than the earlier prototypes so it remains to be seen if they will be as efficient as was claimed for the prototypes. Loremo plans to produce two models of a sub-500 kg (less than 1100 pounds) four-seat vehicle with 0.20 drag coefficient by 2009. The rear seats are small, rear-facing and intended for children. Both models use a small turbodiesel engine and 5 speed manual transmission. The LS has a 15 kW two-cylinder engine with 160 km/h top speed and 1.5 l/100 km fuel consumption. The GT has a 36 kW three-cylinder with 220 km/h speed and 2.7 l/100 km. The units are 20 horsepower, 100 miles-per-hour and 157 miles-per-gallon for the LS, and 36 HP, 140 MPH and 87 MPG for the GT. They achieve their high efficiency through light weight and low drag. These would arguably be hypercars if produced. Jetcar is a light, 660 kg tandem two-seat, four-wheeler with choices of 3 cylinder diesel or gasoline engines. Fuel consumption is quoted at 2.5 liters per 100 km (94 MPG) on diesel. Measured consumption on about 500 km Autobahn test was 2.9 L/100 Km versus 3.5 L/100 Km for a 2003 VW Lupo 1.2 TDI 3L covering the same course at the same time. Pricing is 35-46k Euros depending on engine configuration. Appears to reduce drag through streamlining, minimal frontal area and bodywork vortex generation for boundary layer control. The EV1 met all U.S. and GM safety standards and was a highly-energy-efficient roadworthy vehicle at about 150 MPG equivalent. It was so revolutionary that GM crushed almost all of them. Opel created the Eco Speedster and showed the green technology demonstrator in Europe in 2002. It achieves very high fuel efficiency, together with high speed and low weight. Lotus Cars produces the light weight, high-performance bonded Aluminum Elise sports car. The Opel Eco Speedster is based on an Elise chassis. 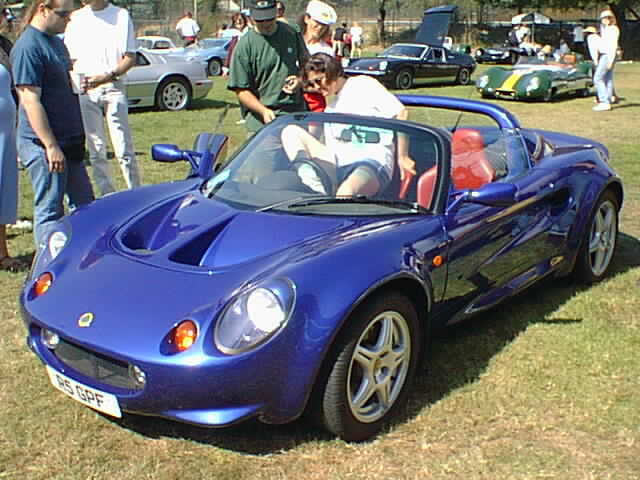 Other current production sports cars based on the light and efficient Elise chassis include the Opel Speedster and Vauxhall VX220. The Volkswagen L1 (or "1 Liter car") goes 100 kilometers per liter or about 240 miles per gallon. The L1 is made of carbon fiber and magnesium and has a drag coefficient of 0.16. Volkswagen UK has a brief description of the L1. The Volkswagen NAS appears to be a study along similar lines, though with much better styling. Both are streetable tandem two seaters. The Daihatsu UFE (for "Ultra Fuel Economy") achieves 55 kilometers per liter or about 130 miles per gallon fuel efficiency on a dynamometer, with probably less in the real world. It has a coefficient of drag of 0.25 and seats four. Its "hybrid system is comprised of a 660cc direct-injection gasoline engine, two (electric) motors and a nickel-metal hydride battery." The successor UFE-2 is said to be the world's most efficient 4-seater as of fall 2003. Team Fate is Professor Andy Frank's hybrid car think-tank and car-building team at U.C. Davis. In addition to having built several unique hybrid vehicles and competed in them, they've done lots of pioneering research into plug-in hybrids that has influenced GM, Toyota, Ford and others. They've more than quadrupled the effeciency of some gasoline cars along the way. The Automotive X-Prize hopes to spur the creation and commercialization of 100+ MPG cars as the X-Prize pushed commercial space travel. C. Michael Lewis' 2008 Electrathon racer did about 1940 MPG. While not a hypercar in the conventional sense and obviously not roadworthy, PAC-CAR II is an impressive achievement of technology to capture a world fuel economy competition at over 12,665 MPG equivalent from a Hydrogen fuel cell. It's a tiny, highly-streamlined, carbon-fiber sandwich three-wheeler with 0.25 square meter frontal area and drag coefficient of 0.075. Weight without driver is about 30 kgs (66 pounds)! Honda and Toyota build hybrid gas/electric cars using conventional steel car bodies or the high-tech, lightweight Aluminum-intensive chassis of the Honda Insight. Toyota's Prius is a step in the right direction, though only a minor step towards hypercars. Edmunds' article on the Honda IMAS includes photos. World Business Council for Sustainable Development (WBCSD) has a Sector Project for Mobility which has news and information about hypercar development. Michelin's Challenge Bibendum is a fuel efficiency contest and showcase for emerging technologies that can make cars cleaner and more efficient. Green Car Magazine tracks the latest hybrid electric, low emission, and high fuel economy vehicles.